Painful name for painless printing? Dell has revealed that it will be offering a new piece of software along with its imaging portfolio, PaperCut print management. 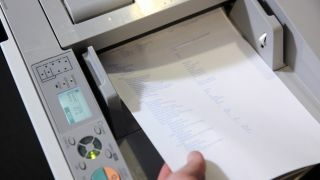 The new software promises to help business of all sizes manage their printing environment, use their resources and improve security. PaperCut can be used as a monitoring service to track, control and record printing tasks. New "Pull Printing" options can be used to hold a printing task in a server and release it on any device that supports Dell's software. The feature hopes to attract businesses with large buildings and staff worried about leaving valuable documents on display. Dell has also geared PaperCut towards the education sector, implementing features such as top-up cards and scripting capabilities like free printing during class times. An audit trail, according to Dell, is also recorded onto the software, enabling customers to check whether guidelines in their businesses have been adhered to. Dave McNally, marketing director for Dell Imaging, said that the solution gives businesses increased control over printing policies and capabilities including security, cost and waste. PaperCut software has full support for Macs, Windows, Linux and Novell network environments ands available complete with support via Dell in the UK.